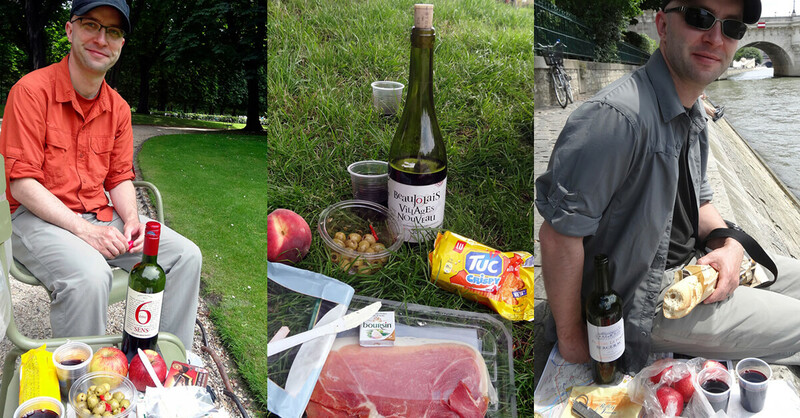 A cheap date in Paris: The essential picnic • Where Is Your Toothbrush? Western Europe can be a nightmare for your travel budget, especially if you want to thoroughly savor the national bounty. This is particularly the case in France, and even more so in Paris, where dozens of cafés, boulangeries, patisseries, creperies, beckon you along the walk from the Metro station to your hotel. So how do you take part in the French food experience—wine and cheese included—without spending hundreds of euros a day? How can you have a cheap date in Paris? 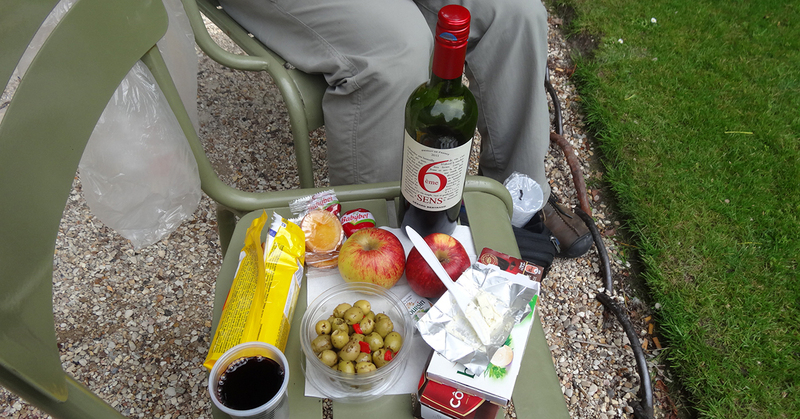 On our visit to Paris, we made a habit of having a picnic for a few of our meals. 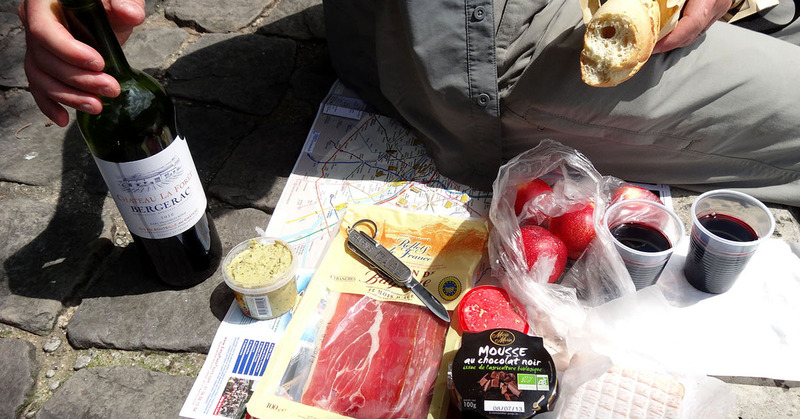 First stocking up on essentials at the neighborhood supermarché, we headed to some famous picnic sites. 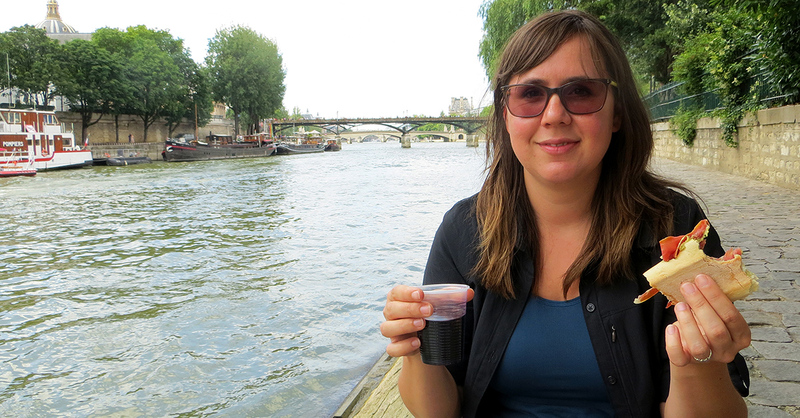 A meal, sightseeing and a cheap date in Paris—for less than 20 euros for two, including wine. Wine. 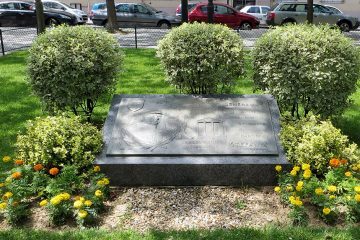 We confess to not know much about French wine, but knowledge is not a prerequisite. All of the wines we enjoyed on our picnics we’re under 8 euros and they we’re all amazing. When in doubt, stick with Bordeaux blends, which are easy to drink and go with everything. Also, drinking alcohol in (most) public parks is totally legal in Paris, but if a particular park doesn’t allow it, they will post it on their entry sign. Cheese. It’s not all about brie–France has 300-400 distinct types of cheese. Break out of the brie zone and try a little comte and even a French blue cheese. There are nice spreadable cheese at the markets, such as Boursin, that come in individual servings that are perfect for picnics. Bread. Boulangeries sell baked goods and many Parisians visit them more than once a day for a croissant in the morning and a fresh baguette in the evening to have with dinner. Boulangaries often double as patisseries, where you can find eclaires, tartes, millefeuille, macarons–and most items are under 4 euros. Buy a baguette for your picnic and an eclair for the walk to the park. If you are sick of bread, crackers go well with French cheese but they are harder to find. Dessert. If you’re not into pastries, check out the refrigerated section at the supermarché, where you’ll find mousses, parfaits, and custards. And there’s always biscuit (cookies) and Nutella, or simply bars of fine dark or milk chocolate. Optional. Fruit, olives, paté, or sliced meat can be added to complete your picnic. Take some time to browse the supermarkets and neighborhood food shops and don’t be afraid to try something new. 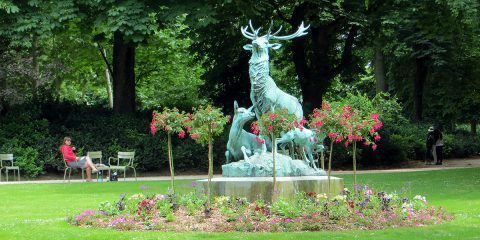 Now that you’ve packed your picnic, head out to one of Paris’ famous picnic sites, sit back, and spend a leisurely few hours quaffing, munching, and people watching (perhaps the best free thing to do in Paris). Et voilà, a cheap date in Paris. Lindsay is a co-founder and co-writer of Where is Your Toothbrush? She has always been curious about what other people eat. As a traveler, she explores cuisines of the world, studying how people's environments shape their diets. In 2016, she launched The Salad Lobby, a website celebrating one of the world's simplest, most universal dishes. You gave up Portland for THAT? I know, right? 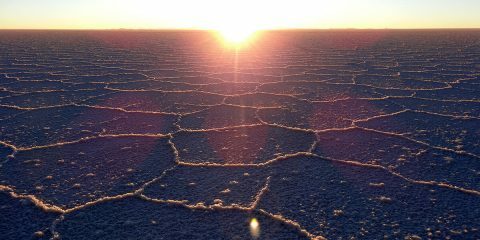 We should just pack up and come home. You have a point, Jane. We used to eat proper, home-cooked lunch at a kitchen table with forks and knives and plates. Now look at us, eating supermarket food and drinking cheap wine from plastic cups on some paving stones and park benches. Oh, the food and drink of Paris. Just one more reason I think Paris is the best city in the world. Who doesn’t love wine, bread, and cheese? I agree! It’s amazing how well one can eat for so few euros. Agreed all around. I was amazed at the quality and ‘real-ness’, for lack of a better word, of even moderately priced supermarket items. 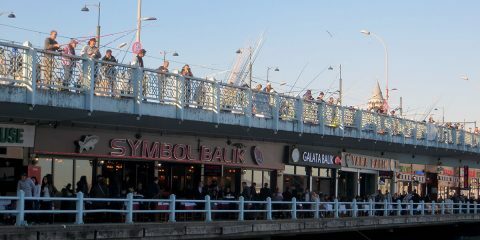 I will always be thankful to the French nation for being so demanding of their food–we all benefit. Mmm….that’s one of our favorite meals here at home…but our wine isn’t as good for that price. I will never cease to be amazed by the low prices for good wine in France. I suspect there is a secret cabal in France working to make wine cheaper than water. Love cheap dates in the park, we are guilty of them all over Europe! They are the best! Fresh air, green everywhere, quality people watching.